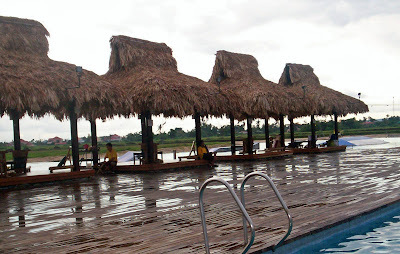 On a recent business trip to Naga with a couple of officemates, our local hosts instructed our driver to take us to the famed Camarines Sur Water Sports Complex, or CWC for short. I'm not sure whether they expected us to try out wakeboarding, regaling us with (made-up) stories of their own sommersaults, but when we got there and saw wakeboarders falling with such a splash on the water, we chickened out. We had time to kill - and left-over money to spend from our allowances - before our flight back to Manila the next day, so we stayed, and did the next best thing - eat, of course! 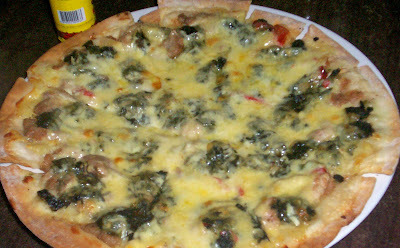 We followed our hosts' last instruction as we parted, to order the pinangat pizza, which appeared something like Bicol pizza on the menu - pizza topped with the distinctive dish of the region, laing, or dried taro leaves cooked in coconut cream. We heard it was the favorite of foreigners who frequent the sports camp. My companions said we were not foreigners, haha. It was not that bad actually. It just needed more spices to heat it up. The generous melted salty cheese topping drowned the laing taste a bit. It tasted somewhat like Amici's current spinach canneloni, which, to me at least, deteriorated from the delicious version I first tasted years ago. 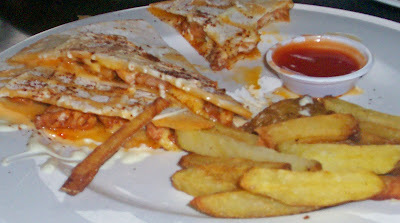 The 4-piece chicken quesadilla was superb, though, served with a handful of fries. When you go there avoid the shrimp popcorn at all costs. We didn't have the chance to try the other items on the menu, but I'm planning to take my family back for a short vacation. To really get to wakeboard, and eat more. The rates are still cheap, because it has just opened. Hourly rates for wakeboarding are at Php165, inclusive of gear rental, at the end of which hour maybe you'd be more than bruised and exhausted from falling, haha. 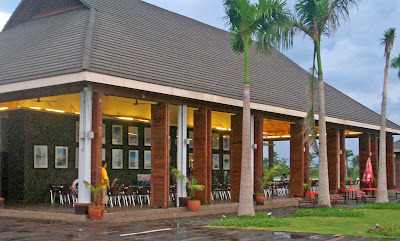 The food does not carry burdensome VAT and service charge. That pizza was only Php160, and other pizza flavors are all below Php200. What else did we eat in Naga? Chicken in Coconut Cream, Burgers and Cakes!